The last time I posted, I wrote about Georgia Holt Sublett. Today, I write about her again but this time it is her obituary. I have a slip of paper that equates as her obituary. It has a jagged edge and is faded with the years. However, it tells us a story, and even more facts. I am not an expert in obituaries, but I suspect most of the current ones do not give the specific time of death. I am not sure why this one does. Do you? What the slip of paper cannot tell me because it has been cut away, is that Georgie died on 10 April 1950. She was only 67 years old. The obituary does not tell us the cause of death, but it does tell us that she was survived by her own mother and her husband. I may have to send away to find out cause of death. The obituary also gives us a look into her family, as we read that all of her daughters are married. It seems like an oversight or something as only one of the daughters is listed by name. As an amateur genealogist, I like to see the names of the siblings and their locations. This helps me in finding out more about them. Below is a great picture of her and her mother. 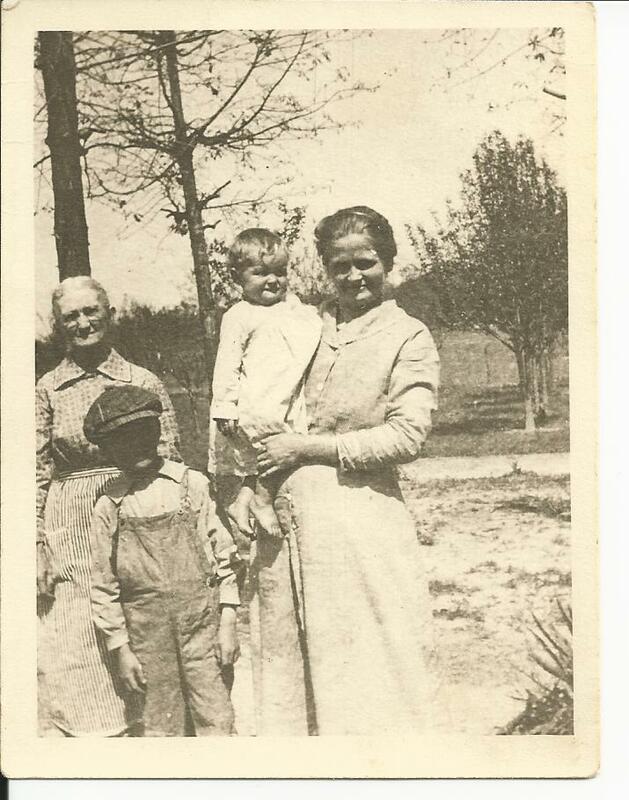 My grandfather Lacy is standing there in his overalls. I believe it is Clarice, the youngest in her arms, but I am not certain. I do not know how old Lacy is, but he looks younger than 10, if this is true, we can safely say that this photo was taken before 1920. I wish there wasn’t a shadow on my grandfather’s face. Until next time, I will keep exploring backwards. 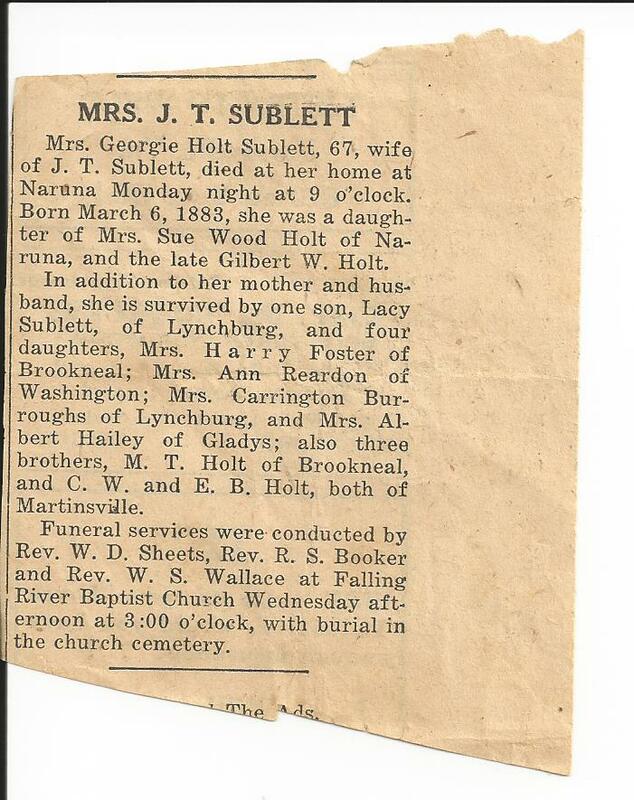 This entry was posted in Holt, Sublett and tagged Sunday Obituary. Bookmark the permalink. I think she had a heart attack or fatal stroke as i don’t think she had been sick. Mamma and I were at the movies when a notice was put on the screen for us to go to the lobby. My Daddy was there waiting to tell us that his mother had died. I don’t know why we were at the movies on a monday night unless it was Easter Monday or some sort of spring break. I was 9 years old. I think the movie was “Nancy Goes to Rio”.